Does following an organic diet for Asperger Syndrome in children help to alleviate their symptoms? Some parents find taking this step helpful, while others haven't found it to be an effective treatment strategy. Asperger Syndrome is a disorder that falls within the scope of Pervasive Development Disorder. People who have been diagnosed with it have trouble interacting with others. Their social skills may not be well developed, and they like their life to have a very specific routine. Another symptom of Asperger Syndrome is when a child focuses his or her attention on one or a few things only. This medical condition is quite rare, affecting 3 out of every 10,000 people. Once Asperger Syndrome has been diagnosed, an individual treatment plan is devised for each child. Counselors can help him or her to learn how to interact more effectively with others. Parents and teachers can provide assistance as well by using techniques like role playing to help the youngster practice appropriate behavior. Eating well is one of the keys to good health for people of all ages. A combination of foods should be consumed each day, including fruits and vegetables, dairy products, meat, and whole grains. Since they are still growing, children also need to consume a certain amount of fat as well. In some cases, an organic diet for Asperger Syndrome in children may offer some relief from the symptoms of the disorder. When additives and food dyes are eliminated from the diet, a child's behavior may improve. The young person may find it easier to focus while at school and while in therapy sessions to help them learn more effective techniques for interacting with others. A food or drink item listing ingredients such as Red 40 or Blue #1 are to be eliminated from the child's diet. This would include foods like brightly-colored fruit punch and frosting on cakes and cupcakes, as well as fruity cereals and some brands of children's vitamins. Artificial flavoring materials are also not part of the Feingold Program. Many chemicals can be used to give a food a particular taste or make it more palatable. Processed foods, such as baked goods and candies often have these ingredients. Synthetic preservatives are commonly used in foods. Consumers may be surprised to find that they are made from crude oil. Although natural food preservatives are available, they are more expensive than the synthetic versions. Another option for organic diet for Asperger Syndrome in children is the Gluten Free Casein Free diet. 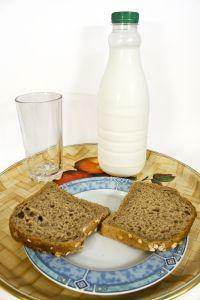 Under this eating plan, children avoid eating foods containing gluten, such as wheat, rye and barley. Casein is found in milk, and it is not one of the foods included in the Diet. Kalle Reichelt, M.D., theorized in 1991 that there may be link between consuming gluten and higher than normal levels of protein in the urine. Dr. Reichelt speculated that the increased levels of urinary peptides, resulting from incomplete digestion of gluten and casein, have a negative effect on brain maturity. This lack of brain maturation contributes to the social awkwardness that children with Asperger Syndrome experience. Whether an organic diet for Asperger Syndrome is an effective way to treat its symptoms is still up for debate. Some parents who have tried an organic diet report an improvement in symptoms, while others didn't find that this approach helped at all. Parents of children with Asperger Syndrome should discuss their child's diet with his or her health care professional so that it can be incorporated into an overall treatment plan.